DANAKIL DEPRESSION, Ethiopia — In oppressively dry heat and a miasma of sulfur and chlorine, the rocky landscape sprouts patches of neon green and yellow that resemble oozing scrambled eggs. Near-boiling pools of acidic water bubble between odd formations of rocks and minerals: white beehive-shaped mounds of salt, yolk-colored lattices of sulfuric crust, purplish-red crumbles. Nearby, iron-rich rock fans out into flat mushroom shapes. The ground crackles hollowly underfoot and emits the hiss of bubbling liquid. Cones and small mineral chimneys babble from one-holed spouts in alien whispers. Though it looks like an extraterrestrial scene, this landscape belongs to the Danakil Depression, in a remote northeast region of Ethiopia aptly named Afar, near Eritrea. 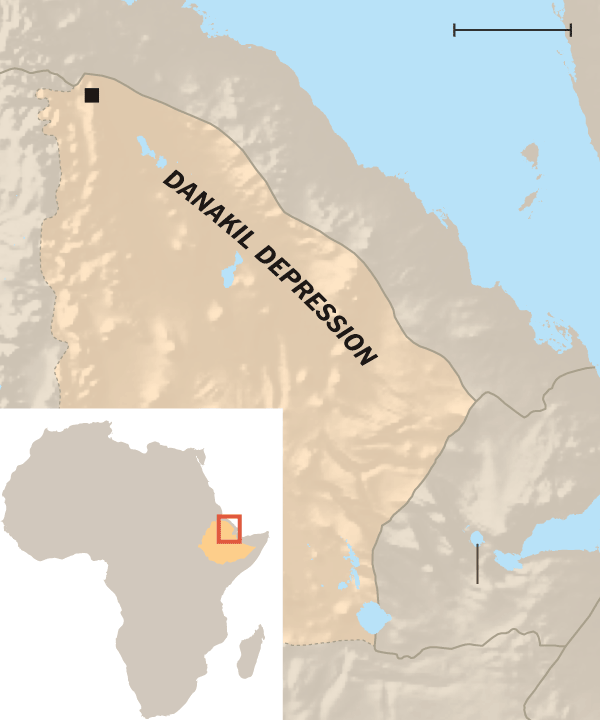 About 100 meters below sea level, the Danakil Depression is one of the world’s lowest places. It is also one of the hottest places on Earth, with average daily temperatures of 34.4 degrees Celsius (93.9 degrees Fahrenheit) and only about 100 millimeters of rain each year. This volcanic region is known as a geological wonder. Indeed, most of the relatively scant scientific research on the Danakil Depression involves its fantastical geology, not its biology. Now, scientists are studying this area to understand the possibilities of life on other planets and moons, despite the region’s political volatility and sporadic violence between Ethiopia and Eritrea. This month, a team of astrobiologists from Europlanet, a consortium of research institutions and companies doing planetary research, returned to study the depression’s geology, mineralogy and especially its biology, as an analogue to Mars. Felipe Gómez Gómez of the Centro de Astrobiología in Madrid led the team’s first expedition last spring to study Danakil’s extremophiles, microbes that live in extreme conditions. Researchers from Madrid and the University of Bologna and the International Research School of Planetary Sciences, both in Italy, assisted by scientists from the University of Mekelle in Ethiopia, are isolating and identifying the hardy bacteria that thrive in this hostile environment of heat, acidity and salinity. The aim is “to try to know the limits of life and the possibility of such forms of life in other planets like Mars,” said Dr. Gómez, who is part of the science team of Curiosity, the NASA exploration rover that landed on Mars over four years ago. He has also studied other extremophiles, such as microbes that thrive in the acidic iron-rich Río Tinto in southwestern Spain. For that research, he and his colleagues exposed an acidophile to simulated Mars conditions, described in a 2010 paper in the journal Icarus. Knowledge from Danakil could be applied to Mars missions. Studying Danakil’s microbes is “a way to train ourselves to identify different forms of life for astrobiological exploration,” Dr. Gómez said. While Mars today has subfreezing temperatures, its origins are volcanic and might be similar to the early history of Earth. The Danakil Depression, a rift valley stretching from the Dallol volcano in Ethiopia to the salt plains of Lake Assal in Djibouti, lies at the convergence of three tectonic plates that are slowly separating. As the earth pulls apart and thins over millenniums, the land sinks. Thousands of years ago, the larger Danakil Desert was part of the Red Sea. But volcanic eruptions formed rock barriers and created an inland sea that eventually evaporated in the intense heat. 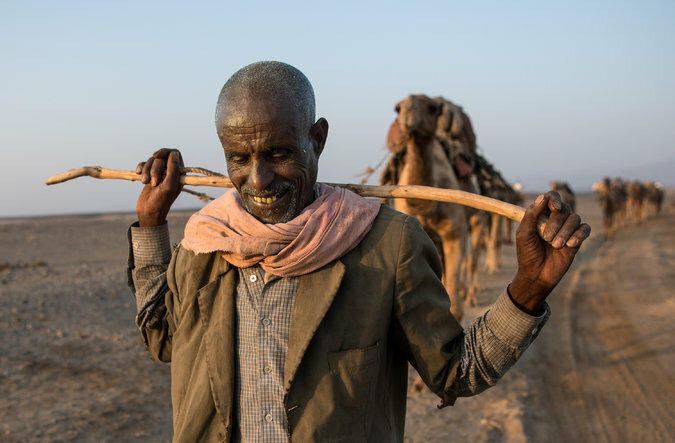 Vast salt flats and salt lakes remain and are still mined by the nomadic Afar tribes, who transport salt slabs from Danakil by camel caravan. Dallol, which means disintegration in the Afar language, is the section that is home to colorful, otherworldly formations. Here, magma heats groundwater, which wells up and dissolves salt, potash and other minerals when emerging through hot springs. Brine evaporates, leaving crusty formations colored by minerals, iron and salt-thriving halophile algae to create this multicolored scenery. Some pools of water reach 90 degrees Celsius. The combination of heat, high acidity and sulfur concentrations causes bright yellow chimneys to form. Other pools of water heated to 40 degrees Celsius take on a turquoise hue from copper salts. Europlanet researchers last year took water samples from salt chimneys, blue and red pools, and yellow and brown crust. Although halophiles — microbes that thrive in saline conditions — have been identified in Dallol, this new research is the first to focus on microbes thriving in extreme acidity and heat, in addition to salinity, Dr. Gómez said. Researchers are isolating bacteria and their DNA and also doing genetic sequencing to identify the bacteria. Among them are chemolithotrophs — micro-organisms that acquire energy from inorganic compounds — that were found in the hot water on the mineral chimneys. These microbes do not require sunlight for energy and are usually found in extreme environments like hydrothermal vents on the seafloor. Chemolithotrophs can use inorganic reduced compounds — like sulfide, elemental sulfur, hydrogen and ammonia — as energy sources, and can grow without organic compounds and light. Scientists believe this kind of metabolism happens only with prokaryotes, microbes without a nucleus. Sulfur is abundant in Dallol because the area was covered by the sea ages ago. Here, sulfur vapor steams from chimneys on the ground. In dark submarine depths, sulfur can be the main energy source for certain bacteria living far from sunlight. In Dallol, these sources of sulfur are within arm’s reach on the Earth’s surface. Scientists are still studying their first samples from Danakil, but “we know there is life,” Dr. Gomez said. This winter’s expedition will focus on bacteria’s relationship with the atmosphere. Researchers will set up weather stations to record wind, temperature, humidity and more, “to study the environment completely, like what Curiosity does on Mars,” Dr. Gómez said. In this case, though, scientists will not have to leave Earth to do so.